Just back from an evening at the theatre; this time I was lucky enough to go see brand the new musical, Betty Blue Eyes, currently in previews at the Novello Theatre in London’s West End. IT’S 1947 – AUSTERITY BRITAIN, BELTS ARE BEING TIGHTENED, FAIR SHARES FOR ALL, THE COLDEST WINTER IN DECADES AND A ROYAL WEDDING. SOUND FAMILIAR? Adapted from Alan Bennett and Malcolm Mowbray’s hilarious comic film ‘A Private Function’; a tale that centres around Betty, an adorable pig who is being illegally reared to ensure that the local dignitaries can celebrate the forthcoming Royal Wedding with a lavish banquet while everyone else makes do with Spam®. This utterly British musical, full of eccentric characters, has a deliciously witty score by Stiles and Drewe and a marvellous cast of great British actors, headed by Sarah Lancashire as Joyce, Reece Shearsmith as Gilbert and, of course, Betty as Herself. 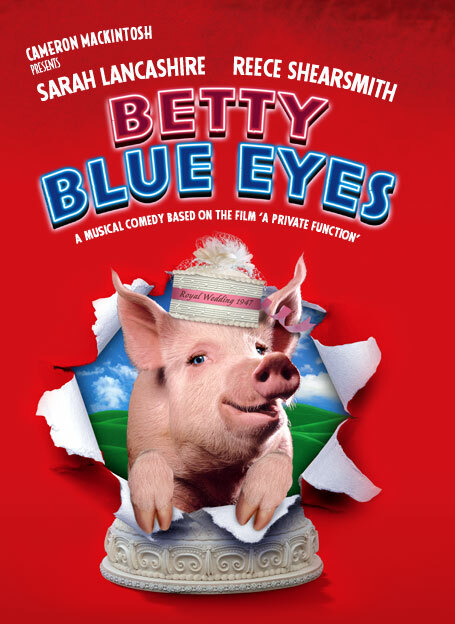 BETTY BLUE EYES IS LIKE NO MUSICAL YOU WILL HAVE EVER SEEN! I am a HUGE fan of 1940s Britain, and so to finally get a decent musical which is set in this era is fantastic!! Of course, the parallels with modern-day Britain are striking (one would even suggest they may have engineered there also now being a Royal wedding to suit their show! hehe) and so this musical is TOTALLY perfect for the time that it’s arrived into the West End! The thing that I think that I love the most about this musical is that it is so quaint and British! I imagine this show will go down a storm with the tourists, who presumably come over to the UK and find that they want to see a show in London whilst they’re here, and perhaps other shows may come across as a little ‘corporate’ or generic, whilst this is a show that absolutely screams “hey, look, we’re in Britain!! !” Just a thought anyway – I know that would certainly be a major plus for me if I was visiting from abroad. The entire cast of the show are very strong. It took me a little while to warm to the lovely Sarah Lancashire and Reece Shearsmith – however once both had got to their first ‘big numbers’ then I instantly fell in love with their characters. Sarah Lancashire, especially, is a big find for the West End in my opinion! Really loved her song ‘Nobody’. Shearsmith also delivers a great performance and is perfect for the role. However, as much love as I have for these two, I have to say that I fell instantly for the two secondary characters of Mother Dear (played by the delightful Ann Emery – who amongst other things, created the role of Grandma in Billy Elliot The Musical) and the quintessentially British ‘big baddy’, Inspector Wormold (played by well-known actor Adrian Scarborough). Both of these characters were portrayed fantastically I thought and I could never take my eyes off either whilst they were on the stage. The production manages to encapsulate some of the 1940s glamour (and grit!) of the day and, from a choreography view, I especially loved the Charleston Dance Hall scene, perhaps my favourite. I really liked all of the costumes and the general all-round feel of the show. The orchestra do a sterling job (I love the ‘reveal’) and the show gets huge kudos from me for not only announcing the name of the conductor at the start of the show, but for also having an Entr’acte (increasingly rare these days!!!) and all of the musicians wearing tuxes!! 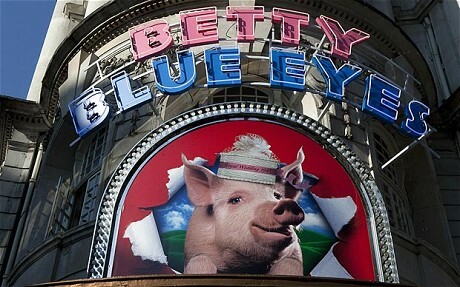 Betty Blue Eyes is a show that I can tell that I am going to want to see again, and again, and again! 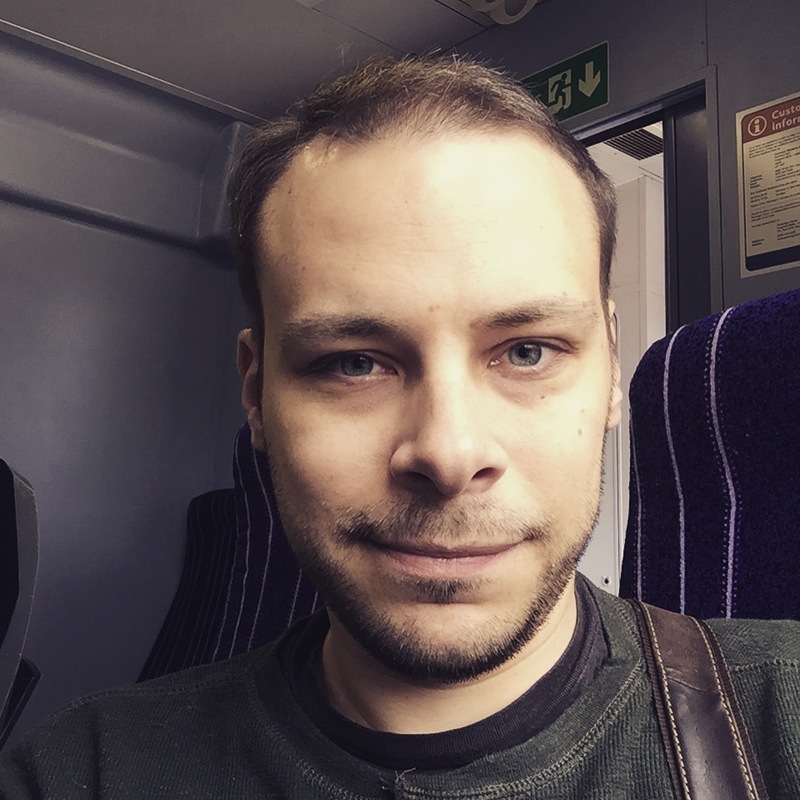 I’d love to be able to highlight a few things that I wasn’t so keen on in the production, however, if I’m being honest, I’d struggle to do so – there’s certainly nothing standing out in my mind, it genuinely is a good ol’ fashioned fabulous night out! Come the curtain call, I actually felt a little bit emotional whilst I was sitting there clapping my hands off – not for any reason relating to the story line, just because I felt that they’d done a really good job and everything in the production had come together so perfectly! (These days fewer and fewer shows seem able to do this to me!). I’m sure that every reviewer this side of Hong Kong will be churning out reviews and witty soundbites laden with swine related jokes, and so I’ll try to confine my flourishes to just the one paragraph 😛 Betty Blue Eyes is a show that (quite literally) brings home the bacon! There’s not one ham performance or any hogging of the stage from any of the actors, and you can believe me when I say that I’m totally not telling you porky pies! You certainly couldn’t say this show is boaring (extra credit, right? :P) and I guarantee that you’ll trotter off down the street on your way home squealing with delight!! Hi Gari, just read your review on Betty Blue Eyes and totally agree with you. I was there on the 1st preview (march 19th) and ive seen it again (April 8th). The cast are superb and i look forward to my next visit as soon as i can. I live & work nr Sheffield so trips to London are precious, altough i do try & get down as often as i can. Will look at other blogs & reviews that you post. ← Sam Tsui & Kurt Hugo Schneider – BORN THIS WAY!